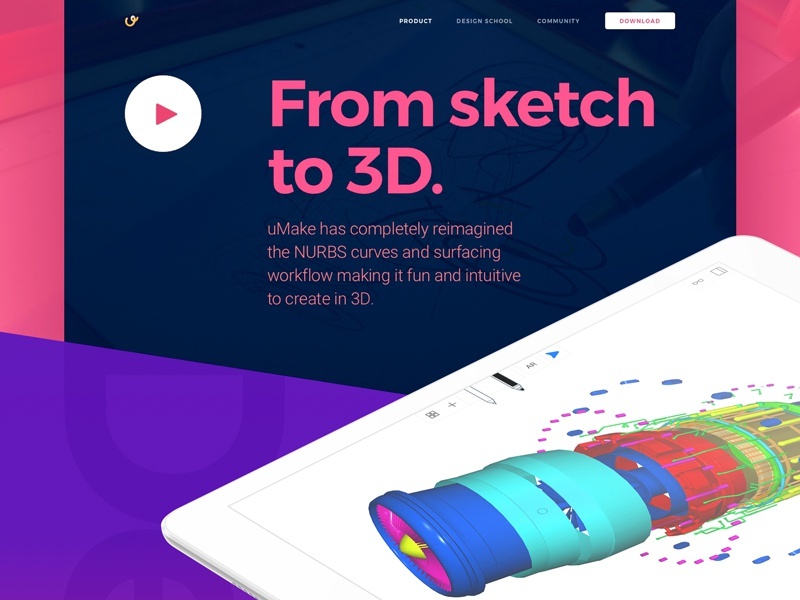 Here’s a part of another website page we created here at Zajno for cool friends of ours from uMake, a rad platform that allows sketching in 3D while offering robust design tools, cutting-edge AR integration for placing your creations in the “real” world, and dynamic content marketplace. You may remember the project, we already told you about it, it’s the one that went live about a month ago. The page you see above represents a set of product’s features that make the app useful for professional users. You can find it here. Creating a top-notch website that would introduce uMake’s innovative mobile application to the public, showcasing its main advantages and features and conveying the idea of its simplicity and usability. One of the requirements was having bold typography and vibrant colors, pretty much screaming at ya. But in a good way, you know. Not to mention – the content displayed on the website was created in the app and was provided by the client. Our main focus was to present the app’s innovative nature using vibrant colors and bold typography as that was one of the requirements. Another task was to use lots of heavy graphic content and it was a real challenge to make it all load smoothly without affecting the usability of the website too much. The overall style was defined together with our client according to the moodboards we created. We ended up with a vibrant, visually rich page that showcases the app’s main benefits and features to prove users it’s exactly what they need to take their creativity game to the next level. By the way, you can check out the live version here! Share your thoughts, your feedback is always appreciated!